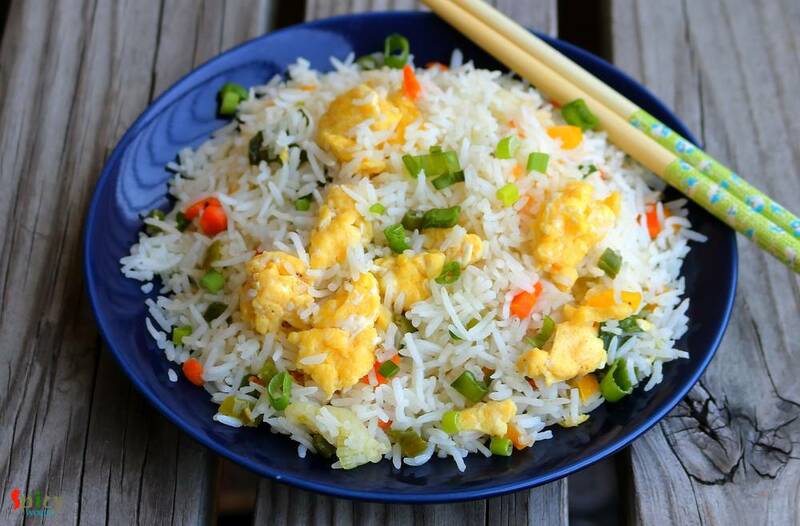 Egg fried rice is a delicious variety of Indo-Chinese fried rices. It's a quick stir fry of rice, veggies and eggs with some seasonings and sauces. 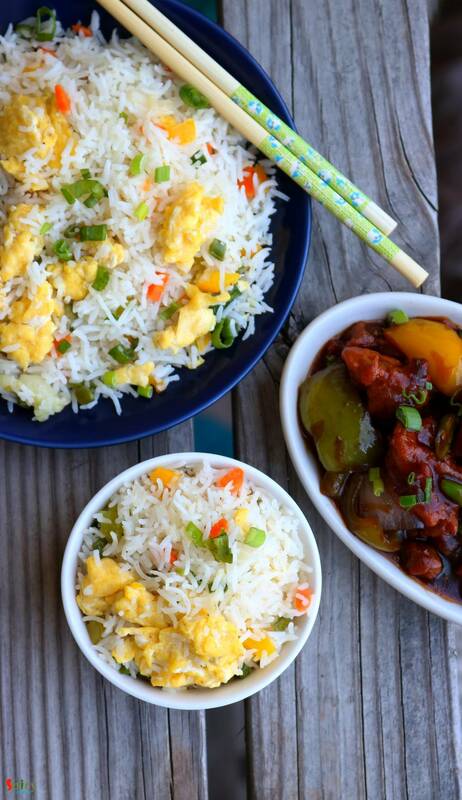 The best way to make Egg fried rice is by using left over rice and cooking on high flame, like many Chinese dishes. 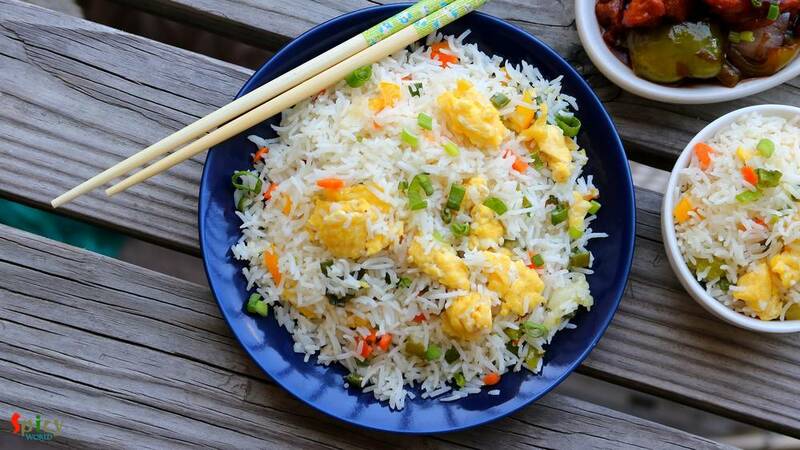 You can have this fried rice on its own or it can be paired with any manchurian gravy or chili chicken or chili paneer. Half cup of chopped mix vegetables like carrots, green beans, capsicum. 1 Teaspoon of freshly ground black pepper powder. Wash the rice very with plenty of cold water, Then discard the dirty water. Now soak the rice in 2 cups of cold water for at least 1 hour. Then heat 3-4 cups of water in a vessel. When the water starts boiling add 1 Tablespoon of salt and 1 Tablespoon of oil. Mix well for a minute. Then add the soaked rice only. When the rice becomes al dente or 85% cooked (do not make them mushy), drain the rice in a colander. Let the rice comes to room temperature, then put them in fridge if you are making the fried rice next day. If not then let the rice cool down completely. Now heat 1 Tablespoon of vegetable oil in a wok. Then crack open 2 eggs along with pinch of salt. Scramble the eggs on high heat for just 40 seconds. Then add a pinch of black pepper powder, give a good stir for a minute and immediately remove them from wok. Do not cook them long otherwise they will become rubbery. Add chopped garlic and green chilies. Saute for 30 seconds. Then and chopped onion and fry on high heat for 2 minutes. After that add mixed vegetables and some salt and pepper. Fry on high heat for 3 minutes by constantly mixing with the spatula. Next add the cooked rice, some more salt, soy sauce, vinegar, sesame oil and black pepper powder. Mix well on medium heat for 2-3 minutes. Lastly add those precooked scrambled eggs and chopped green onion (if using). Mix well and turn off the heat. 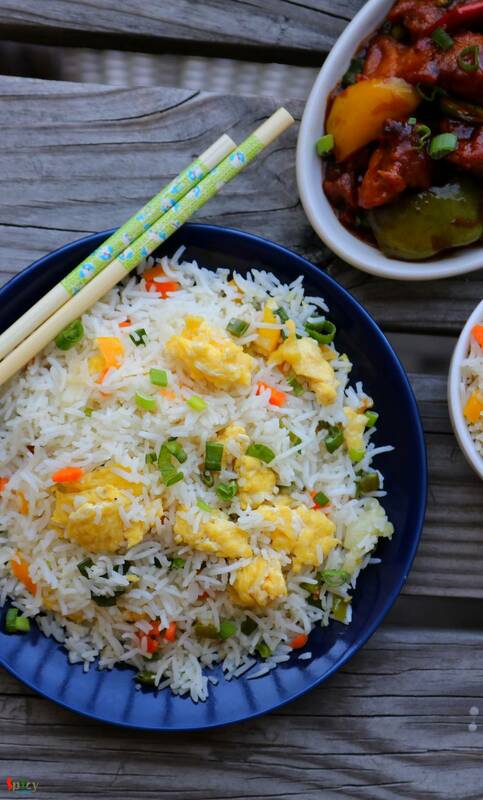 Your egg fried rice is ready to serve. Serve this hot with any manchurian gravy.